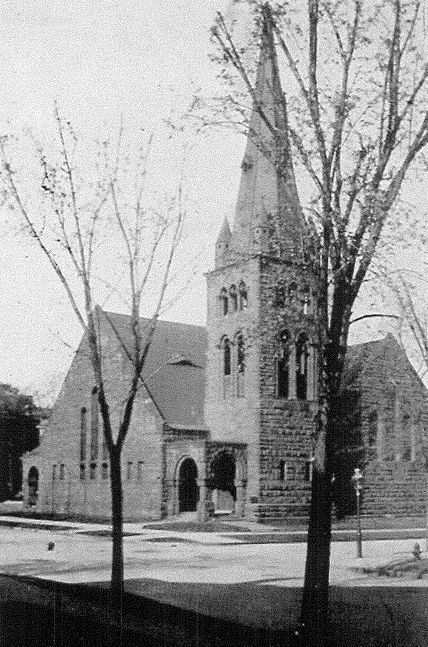 Constructed of brownstone, the design of Dayton Avenue Presbyterian Church is Richardsonian. 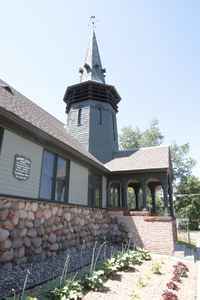 Following the "Akron Plan," a popular arrangement for Protestant churches, the primary entrance is located in the tower and the sanctuary resembles an auditorium. The floor slopes to the altar, and there is no basement under the sanctuary. The stained glass (not original) in mostly abstract patterns, is richly colored. Gilbert tried to get The Tiffany Glass Company to build windows for the project, but the budget was so meager that Tiffany's representative, John Du Fais, responded that even if they had no other work, they could not afford to make the windows at the price Gilbert offered. [The Tiffany Glass Company to CG, October 25, 1887, Box: 3, Fldr. : 19, MNHS-CGP.] Du Fais would become Gilbert's partner in the winning design for New York's Union Club (1900-03). Gilbert would see Louis Comfort Tiffany socially after the turn of the century.[E.S. Hale to CG, March 11, 1901, Chronological File, 1887-1901, NYHS-CGC.] In 1909, the tables would be turned and it would be Tiffany soliciting Gilbert's business. [Tiffany Studios to CG, January 4, 1909, Box: 20, Fldr. : General Correspondence, 1903, MNHS-CGP.] Joseph Wells, Gilbert's friend and colleague at McKim, Mead & White, once chided him for believing in "Pope Tiffany. "[Joseph Wells to CG, February 4, 1883, LOC-CGP.] Wells was not referring simply to art glass, and his observation accurately described Gilbert. 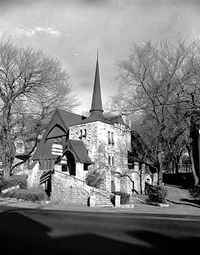 Like the Goodrich Avenue Church, the Dayton Avenue Church was a "mission" church established by the three Presbyterian churches in St. Paul. 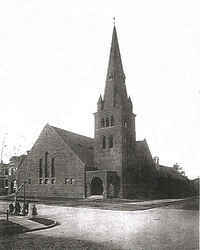 The Dayton Avenue Church is a large building and was an important accomplishment for Gilbert & Taylor. 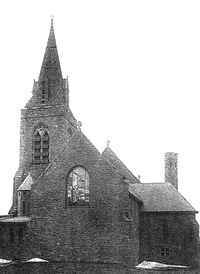 The Gilbert family would join the Dayton Avenue Church after the building was erected. In 1903, Gilbert designed a large hall for the building. In 1910, he designed a Sunday school-addition. The style of the additions was half-timbered. A longtime minister of the church, with whom Gilbert worked on the additions, was Maurice D. Edwards.